As there is little market research publicly available on mobile e-commerce spending patterns, we’ve conducted our own mobile spending survey, to provide a more in-depth look at the current state of mobile commerce spending patterns across 5 major product categories. The survey was conducted in June 2013, with a total of 2,174 respondents, all US adult internet population, focusing on mobile and tablet online purchasing behavior. The survey showed that 75.1% of smartphone and tablet users hadn’t made a purchase from their mobile device in the past two months. In other words, most people don’t shop online from their smartphone or tablet on a regular basis (yet). Total mobile spending amount distribution – notice how 1/3 of mobile shoppers already spend $100+ during a two month period. Looking at the other group, those 24.9% who do purchase on their mobile device, we see that these “mobile shoppers” have spent an average of $98 in “mobile purchases” during the past two months. What’s more, when looking at the total spending amount distribution, we see that the two $100+ segments constitute 32% of these mobile shoppers – a group of early adopters who regularly purchase from their smartphone or tablet. That’s 8% of all mobile users who have fully adopted their mobile device for multiple shopping purposes (above $100). While still a small figure, it certainly isn’t insignificant, and given the explosive growth in all other areas of mobile one should expect to see a rapid increase in these regular mobile shoppers in the coming years, with the market switching from an “early adopters” stage towards “early majority”. Note that these percentages will exceed 100% when summarized as the survey respondents were allowed to pick multiple product types (since people naturally purchase many different types of products). Similarly, the overall mobile spending average of $98 exceeds any one of the product type spending averages as a person’s spendings across categories naturally accrue to a larger overall spending value. “Digital products: apps, music, video, etc.” have, by far, the largest share with 43% of all mobile shoppers having made a digital purchase within the last 2 months (corresponding to ~10.75% of all mobile users). Given the built-in support for digital purchases such as music and apps through platform-specific app stores, this should come as no surprise. Digital purchases are however also often the ones with the lowest price points, so despite being ordered in large volumes the average spend only accrues to $50. “Travel: tickets, airfare, hotel bookings, etc.” is the least purchased type of product, with only 17% of mobile shoppers having made such purchase within the last two months (corresponding to ~4.25% of all mobile users). This might be partly related to this product type being less of an on-the-go impulse purchase, and therefore something people do from a laptop or desktop computer instead. It could also have something to do with the complex search, selection and booking process typically necessitated by travel sites to complete a purchase – all of which is particularly difficult get right on a mobile-optimized website, as revealed during our mobile usability study. For those who do purchase travel products and services the average spend is relatively high at $74 (despite including local travel ticket orders of low price points, such as app-based bus and train ticket purchases). “Entertainment: dining, cinema, concert, etc.” are the third most purchased product type on mobile devices, with 22% of mobile shoppers having purchased entertainment related products within the last two months using their mobile device (corresponding to ~5.5% of all mobile users). This suggests a high synergy between small portable mobile devices and time-sensitive entertainment services such as tickets for a movie, the theater, sporting events and concerts – on-the-fly-in-the-moment purchases enabled by mobile devices. 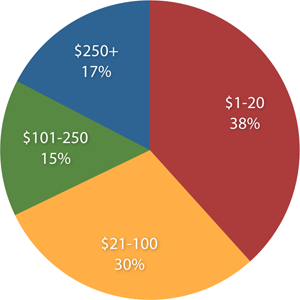 The total spending on non-digital entertainment purchases comes in at $62. “Apparel: clothing, accessories, shoes, etc.” are the second most purchased product type on mobile, and the most purchased non-digital product type, with 24% of mobile shoppers having purchased apparel products within a two month period (corresponding to ~6% of all mobile users). Furthermore, apparel have by far the highest spending amount of $84. Combined this makes the apparel industry the most progressed non-digital mobile commerce product type at this moment. “Physical products: electronics, grocery, etc.” are well represented with 20% of mobile shoppers having purchased physical products such as groceries or electronics online using their mobile device in the past two months (corresponding to ~5% of all mobile users). Together with apparel purchases, this goes to show that instant gratification isn’t a requirement for mobile shopping and that entering shipping details isn’t a showstopper either as long as the site is properly designed. Like apparel, physical products have a relatively high spending amount of $75.1. What’s clear from these numbers is that mobile shopping is not just about apps and digital entertainment, with 72.4% of those who have made a purchase on a mobile device during the last two months having purchased non-digital goods (in addition to any digital purchases). Given that sales are generally distributed broadly across a wide set of non-digital industries, mobile clearly represents a significant opportunity for a wide range of e-commerce businesses and not just media companies and app developers. While there are still many people who don’t regularly shop from their mobile devices the shift is happening, and it’s happening fast. Over the coming years more and more people will be spending an increasing amount of money shopping from their mobile devices. Unfortunately many e-commerce stores have rushed into the game and gotten themselves an inferior mobile site that suffers from poor usability and alienates new and existing customers (as explored here and here). This may have been acceptable in the early days of mobile, but no longer – those early efforts must be improved upon, with plans for continuous and deliberate improvements to keep up with the increasing importance of this new platform. Authored by Jamie Appleseed. Published on August 27, 2013. Curious to know the numbers for b2b customers. I suspect everyone is assuming the customer is always in an office behind a desktop or at least laptop, and that b2b sites strongly lag behind b2c regarding either mobile-app versions of their sites, separate mobile or responsive versions. Could be interesting to investigate further. Some B2B industries, such as building supplies, have an obvious use-case for mobile commerce sites as the customer will not always be at or near an office when in need for ordering.